Market-altering news was light over the weekend – although there’s still a bit of unresolved anxiety related to the death of journalist Jamal Khashoggi, which will likely fizzle out with time. Crude oil eked out some small gains on Friday but failed to re-take $70/bbl ground. Markets are anxious to see whether prices will regain its upward trek or continue hovering in the $65-$75 range for the foreseeable future. This morning, crude prices are trading flat at $69.02, down 10 cents since Friday’s close. Fuel prices are also directionless this morning. Although both products were in the negative overall last week, they did manage to change directions on Friday and demonstrate some small gains. This morning, diesel prices are trading at $2.3133, up 1.1 cents from Friday’s close. Gasoline prices are at $1.8986, trading lower by 1.5 cents. The Khashoggi investigation continues to add some small geopolitical risk to the market. Saudi Arabia now admits the journalist was killed in the Saudi embassy in Istanbul, leaving the world wondering how other governments will respond. Saudi Arabia blames the action on rogue actors, avoiding any direct blame, and it’s unlikely the US will pressure them too directly. Between arms deals, military cooperation, and oil dependencies, there’s a strong political/economic interest in letting this deal fall aside. If Trump does escalate this with the Saudis, the Saudis have threatened to use oil as a weapon – an unlikely yet possible scenario for oil prices to very quickly skyrocket to historic highs. The CFTC released their weekly Commitment of Traders report, showing how futures markets are currently betting on oil prices. Net managed positions in WTI crude (blue bars), meaning total longs minus total shorts of investment groups like hedge funds, fell to its lowest level of the year – even as crude prices (green line) are coming off fresh multi-year highs. Managed money sentiment is at its lowest point since October 2017, after hitting record highs in February. The fresh-low indicates two things for oil markets. First, it shows that sentiment is declining – there’s overall fewer bullish bets than there were earlier this year. Part of that is the recent flip in WTI crude oil to a slight contango position, as we noted last week. 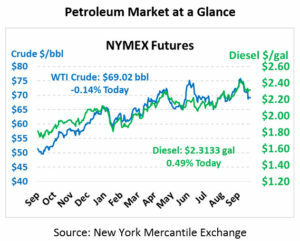 This makes the market somewhat less appealing to traders due to contract expirations for a variety of market-driven reasons, reducing purchases of crude as an investment tool. Second, and more bullish, the declining open interest means there’s room to rise. Typically, a market rally runs out of steam when everyone is a bull and holding crude – all anyone can do at that point is sell. Fewer bulls in the market means that if (when) a surprise headline hits the market, there are still folks left who can buy into the rally – causing prices to potentially rise even higher.